There are two options to establish a communication link between the pilot’s Android tablet running Delair Flight Deck and a Delair UX11: Delair Link or Delair cellular service. Delair Link uses a 2.4 GHz radio link to communicate with the drone and relays the data to the Android tablet using a proprietary radio link. 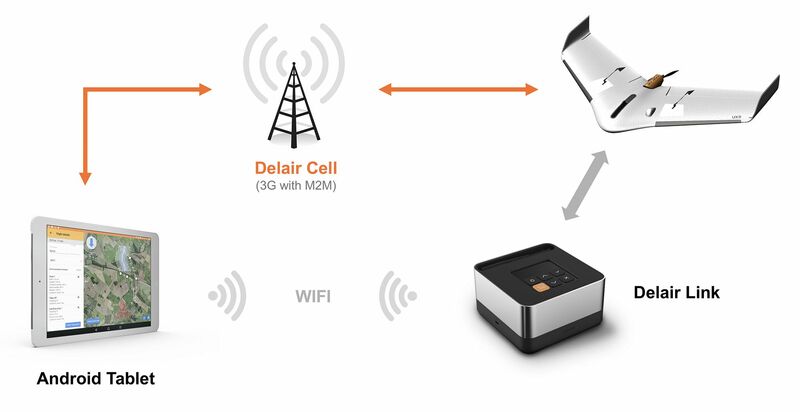 Delair Cellular Service establishes a 3G connection directly between the Android tablet and the drone using a cellular network. This connection uses a secured and proprietary machine-to-machine (M2M) link. Delair Cellular Service is also available on DT18 and DT26X UAV system (see Q&A). All Delair UX11s come with a cellular communications module and a preinstalled Delair SIM card. A second Delair SIM card is provided to be inserted in the SIM card slot of the Android tablet running the flight control software (all format SIM adapter provided). There is no activation procedure. At start-up, both the drone and the ground station connect to the local cellular provider, which establishes a link between the Android tablet and the drone. The connection ensures a command and control link over the cellular network. A cellular link ensures communication even when obstacles such as hills, trees and buildings obscure a direct link. This ensures stability of the link in challenging environments. A cellular link allows virtually unlimited communication range in an area with network coverage. If BVLOS flights are allowed, the 50 km range of the Delair UX11 allows flight distance of up to 25 km out and back in good weather conditions. For users using Delair Link, a cellular link provides a backup link for environments where the 2.4 GHz does not work well due to signal interference or competing frequencies, and may provide better landing position information if the vehicle had to make an emergency landing. A cellular-enabled drone makes your Delair UX11 futureproof. The 3G and 4G-ready M2M connectivity allows for future product enhancement through software updates or by connecting other devices and services to the M2M network. The cellular service is subject to local providers’ coverage: it might not be available or be of poor quality in areas sparsely populated where cellular coverage can be limited. Delair cellular service allows full command and control of the drone but may not support all features available with the Delair UX11 and Delair Flight Deck ground control software. For example, the photo preview feature of Delair Flight Deck during flight is currently not enabled when using the Delair cellular service. There are 3 zones with different pricing. Zone 1 covers most of the Western world as well as China, Australia, and South America. Zone 2 covers large parts of Africa and southeast Asia. Zone 3 covers select islands, African and Eastern countries. Delair UX11 kits come with a 2-year cellular plan (at no additional cost) for Zone 1 and Zone 2. In Zone 1, users will enjoy up to 40 hours of flight time per month connected to the cellular service. In Zone 2, users will enjoy up to 20 hours of flight time per month connected to the cellular service, with the possibility to extend it to 40 hours/month. Following the initial two years of service, all plans may be extended in one-year increments. For operations foreseen in zone 3, customized plans will be tailored by Delair sales representatives. Delair cellular service will greatly enhance your operations as it will enable you to maintain communication with the UAV despite obstacles or challenging terrain and it will extend the range at which you can operate. Switch to Delair cellular service to extend your range when the direct radio link signal becomes weak or obstructed. Combining Delair Link and Delair cellular service will offer the most reliable and long-range communications solution available for a professional mapping drone. Delair cellular service is currently available in all countries shown on the map below (through our roaming service). Clic on a country on the map above to see the available telecom operators. To check actual cellular coverage in the area of interest, the area where the flights will take place, cellular 3G coverage maps of the local providers should be consulted. If local providers do not provide detailed coverage maps, online providers such as opensignal could be used. Be aware that these opensource maps are based on user data. They will not track signal quality of areas without cellular activity. Data quality in neighboring urban areas and along roads may give a hint about the quality in those areas. Always check the link quality prior to flying. Can I travel to different countries and use the service? Yes. Your SIM card is configured for a given zone (normally based on your country of purchase unless otherwise specified) but you can bring your drone to a different zone and it will continue to work. Just know that when you travel to a different zone, the amount of flight time you can perform per month with a cellular link might be reduced depending on the zones you travel to. Can I use my own service provider and/or use my own SIM card? No. Delair cellular is based on a dedicated, worldwide, secured service. It does not work with third-party services and/or SIM cards. What if there is no cellular service in my area? If your country is not listed or if there is no cellular coverage at your particular flight location, use Delair Link. Is it possible to turn the cellular link off for a flight? Yes, the cellular service can be enabled and disabled by the user for a given flight. It is a fully private and secured service. It is based on a private VPN (Virtual Private Network). How can I check my 3G credit left? Just log into your MyDelair account. Is Delair Cellular available on DT18 and DT26X systems? Yes, Delair Cellular Service is also available on DT18 and DT26X systems (as an option). Contact your Delair sales representative for details.